A movement? A trend? A non-story? An overhyped, overplayed AV news headline? Call it what you’ll call it, but Layer 3 was as popular a conservation topic at InfoComm 2016 as the 102-degree Vegas heat. It was hard to walk more than a few booths without having some Layer 3-related conversation with manufacturers, integrators, and managers alike. Some AV pros believe that Layer 3 switches will become more of a necessity as AV and IP continue to merge. From future-proofing a network against bandwidth congestion, to dynamic routing, there are some potential benefits for working Layer 3 switches, especially for large and more complex installations. But, for others in the industry, a protocol is just a protocol, not a panacea. So what’s the big deal and how can we untangle this topic? BACK TO THE BASIC: WHAT IS LAYER 3 AND WHY DOES IT MATTER IN AV? In the seven-layer Open Systems Interconnection (OSI) model, the data link layer (Layer 2) provides node-to-node transfer and is responsible for media access control, flow control, and error checking. The network layer is Layer 3. OSI dcomentation states that the network layer is responsible for packet-forwarding, including routing through intermediate routers. This is possible because it knows the address of neighboring network nodes, and it also manages quality of service (QoS), and recognizes and forwards local host domain messages to the Transport layer (Layer 4). Layer 4 coordinates communications between systems. Layer 4 switches are capable of identifying which application protocols (HTTP, SNTP, FTP, et cetera) are included with each packet, and they use this information to hand off the packet to the appropriate higher-layer software. “Layer 4 switches make packet-forwarding decisions based not only on the MAC address and IP address, but also on the application to which a packet belongs,” according to the team at Black Box. The OSI model is a product of the Open Systems Interconnection project at the International Organization for Standardization (ISO), maintained by the identification ISO/IEC 7498-1. Scott Kalarchik, of QSC’s system group, explained that the big difference between Layer 2 vs Layer 3 has to do with addressing. Better yet, he said, think of it as local addressing vs long distance addressing. Though Layer 3 switches have been making tech headlines recently, they are certainly not new. You might already be familiary with AES67, an Ethernet-based networked audio-over-IP standard. According to InfoComm, AES67 is a Layer 3 protocol suite based on existing standards and designed to enable interoperability among various IP-based audio networking standards, such as Ravenna, Livewire, Q-LAN, and Dante. AVnu Certification for AVB/TSN has now evolved to include Layer 3. Additionally, Pakedge has recently joined the AVnu Alliance, the industry consortium driving open, standards-based deterministic networking, to gain cooperative knowledge with likeminded companies in the Pro AV and residential AV industries. “The continued convergence of AV and IT, along with the opportunistic business in commercial projects for both Control4 and Pakedge, makes joining the Avnu Alliance a strong move as we continue to develop products for light to medium commercial applications,” Philips added. The Coveloz AES67 over AVB demo at InfoComm 2016. 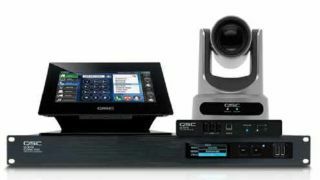 At InfoComm, some AV pros saw an interesting demo: Coveloz AES67 over AVB. The demo featured hardware including the Extreme Networks AVnu-certified switch and the AVnu-certified Coveloz BACH Pro-Audio Networking and Processing FPGA Platform, which is a complete software and hardware implementation solution that serves as a customizable platform for pro audio networking and processing, along with additional audio components. Those components are from Calrex, running AES67 Layer 3 RTP over an AVB foundation, which, according to Coveloz, is proof that IP-based Layer 3 transport protocols like RTP, as well as non-IP based protocols, like IEEE 1722, can utilize the same AVB network at the same time. It was the first public demonstration of AES67 over an AVB foundation, using automatic bandwidth reservation (IEEE 802.1Q) and resilient synchronization (IEEE 802.1AS) to ensure low-latency and high-quality, simple to use AES67 for audio transport. FOCUS ON THE PROBLEM, NOT THE PROTOCOL. Biamp Systems’s flagship Tesira line for networked audio and video. To TJ Adams, QSC’s Director of Installed Systems Product Management, technology is not inherently “good or evil.” Just like Android vs iOS, pitting Layer 2 against Layer 3 is a false rivalry. “When thinking about Layer 3 vs Layer 2, we’re still working with the OSI model which has been around for decades. Layer 3 is not better or worse—it’s just one level up and provides some other tools that a Layer 2 only protocol does not, depending on the application.” The metrics that would influence you to choose one Layer over the other comes down to the “flexibility of being able to route the packets,” Scott Kalarchik explained. Justin O’Connor, product manager of Audio Products at Biamp Systems, takes it a step further. “’Layer 3’ being thought of or touted as a ‘feature’ or as a technology all by itself is a bit misleading,” he opined. There is a lot of hype being attached to Layer 3 as a feature by other networking technology providers, but that doesn’t mean it is truly exists independent from the network. He explained that Biamp’s Tesira solution utilizes elements of Layer 3 in the discovery and enumeration of devices within the Tesira network. Tesira also uses Layer 3 communication for control signals to and from Tesira Control devices (such as the Tec-1, or an instance of Oreno). Connection with and communication to and from third party control systems, also takes place over Layer 3. The various layers of machine-to-machine communication that are available are all means-to-an-end and tools that can be utilized for their advantages and disadvantages, O’Connor believes. Most devices in our industry that are using Ethernet technologies for connection and communication are using elements from Layer 2 and Layer 3. For Adams, it levels out to this: It’s about what problem you are trying to solve and asking what is the best method for solving it. It might mean that Layer 2 is just fine or that you need to move up the stack. In the pro AV industry, which is still evolving its IT acumen, manufacturers and integrators are still in the learning phase of how to relate to their new IT customer and truly understanding the technology. AV is on the path to becoming a subset of the IT industry, but IT people have different ways of looking at solving technical business problems than the traditional AV department used to. With all this shift going on, it does present an opportunity for creativity, to say the least, but misconceptions and misunderstandings can follow. Adams contextualized a scenario: “If you are on a LAN you have Layer 2 and 3, there is not an inherent ‘up or down’ or ‘bad or good’ dichotomy.” If you are running at Layer 3 you are also leveraging Layer 2. You only care about whether a protocol can scale up to Layer 3 if you need to route that media traffic across subnets. That may not be something that needs to happen in most AV installations and if it does need to happen, then there are much bigger considerations than just whether or not a protocol is Layer 3 capable or not. “The point is, QSC isn’t interested in fighting a protocol war,” Adams underscored, noting that the company’s Q-LAN is a Layer 3-enabled protocol. “It is also time-sensitive, leveraging PTP and 1588,” he said. “It’s leveraging networking technology and standards that’s been around for a long time and well understood by most network engineers.” Q-LAN is a suite of IEEE network protocols that make up the networking backbone for Q-SYS audio, video, and control. All Q-LAN protocols are IP-based and can reside constrained on either Layer 2 or Layer 3 routed networks. When asked about AVB, Adams reiterated that it is in the industry’s best interest to eschew easy comparisons and misleading competitions. Most manufacturers are sharing and working in the well-known networking universe with the same protocol standards basis. He explained that “Dante, AVB, Q-LAN, et cetera—all of us are working with the same IEEE standards, by virtue of the fact that all these protocols must play by the known networking rules (standards). In the case of AVB, slightly differently ones apply, but they are IEEE standards none the less.” So all this talk about proprietary vs. IEEE standards is frankly marketing centric, not reality and misses the point. What we need to understand is something very basic to any commercial enterprise. The most important part of creating a solution is understanding your customer’s needs and solving their problems without causing too many new ones along the way. All too often, we as an industry get caught up with technology first and, in some cases, focus on what would make our lives easier. Instead, we should use the technology we have to solves our customer’s problems. Whether we use Layer 1, Layer 2, Layer 3 to do that, or AVB, Q-LAN or Dante, it’s all fine as long as we perform that basic service to our new customer—IT. Biamp’s Tesira uses Layer 3 for discovery and enumeration of devices, among other features. To that end, Dr. Phil Hippensteel, regular AV Technology contributor and instructor at Penn State Harrisburg, offeres three features to help tech managers to distinguish products with IP capabilities. First and foremost, a device should have a user-friendly interface. Hippensteel explained that if the device is capable of using DHCP for configuration parameters, then explanations of the various parameters should be easily accessible. (3) The result of a security policy that won’t allow a TCP connection to be established. “If I can’t see the essential form of the transported video without connecting Wireshark, I face a daunting task to fix the situation,” he said.